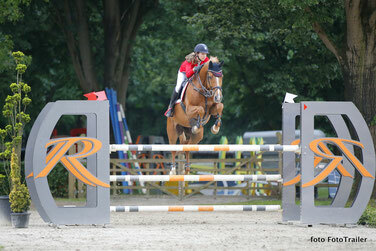 Marie Christine Sebasta from Austriawon the Children Grand Prix at 1.30m level today. In this Schuttebeld Pakfood Prize she rode Kara Luna (Quidam's Rubin). 11 of the 40 competitors jumped clear and came back for the jump-off. The 2nd prize went to Gilles Nuytens from Belgium with the Zangersheide mare Mama Mia Picobello Z (Mr.Blue x Carthago Z).